Whatever label we want to stick on ourselves-cross dresser, transgender, gender fluid or whatever, our style becomes an integral part of us. As we make the migration into the girls sandbox of the high maintenance gender, style is as big a part of our lives as most of the genetic women in the world. Of course most of us (of age) go through our formative cross dressing years without much guidance. We knew what we wanted to look like from the confines of our masculine world. If guys thought we looked like women, we passed and all was good. Then of course, if we pursued it further, we found the world put so many other expectations on us as we transitioned. As I have mentioned here in Cyrsti's Condo and beat it to death in "Stilettos on Thin Ice" (my book), when you play in the girls sandbox you need their approval to go forth in the world. Everyone looks at women-especially other women. So, while I am dazzled anymore about why my posts from three years ago were so into what I was wearing and today are into what I am thinking-I took the time to pause and consider why. The simplest answer is HRT has helped me to either give the world a highly androgynous view of me or a feminine one. But, I thought, not so fast-I do routinely out style my genetic female friends (except Liz) and why is that? The simplest answer to that (for my simple mind) is DUH! the most attractive women in the room are the ones who look like they aren't trying. It's tough to do that, being genetic, transgender or cross dresser. My example is the woman on the left. She is an example of my ideal style. Now, just between us girls, we all know, I'm not getting there in this lifetime. 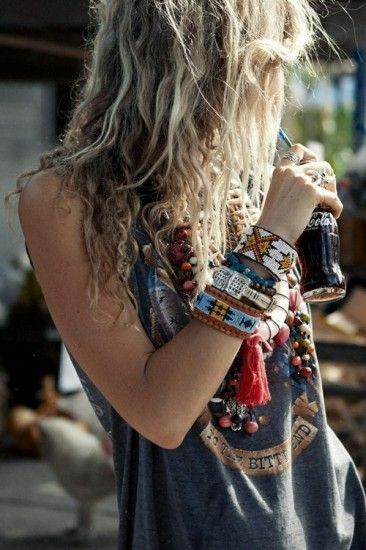 Instead, I go the next best route and try to incorporate as many of the Boho/Gypsy aspects of her style into mine. The beaded necklaces alone represent my increased awareness of Native American and earth based spirituality. Plus, when I go this route, I have a deeper understanding of the Stana's and Mandy's of the world. I think I have read so much of Femulate I know exactly what would be in Stana's wardrobe and I'm beginning to learn the same insight from some chatting I have done with Mandy Sherman. Our paths through the sandbox are the same, often the fun part is how we look getting there. One of the oldest sayings in the cross dresser's handbook was the excuse we dressed in women's clothes only because a mans' was so boring. All true to be certain, but if you are not able to "let your girl flags fly", you simply will be missing much of the fun. As you can imagine from the woman above, back in the day, I really wanted to be one of the girls letting their freak flags fly and I am over joyed the style is coming back!